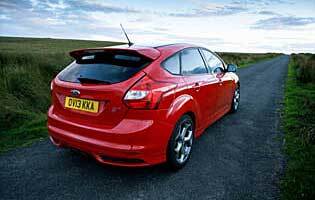 To probably no one's surprise, Ford's first Focus ST was a big hit in Britain. Unfortunately for its many fans, emissions laws and rising fuel prices put an end to the first-gen ST as we knew it, but with this model it's back, albeit significantly changed. Furthermore, you can also opt for a Mountune upgrade to liberate more performance for a modest outlay. The major difference between old and new Focus ST models is the switch from 2.5-litre Volvo power to an in house turbo 2.0-litre unit. Far from being a negative, this new motor delivers more power and is also cleaner and more fuel efficient. And Ford has a solution if you miss the trademark warble of the old five-cylinder Volvo engine - it's added a flexible membrane in the engine bay to amplify a slightly off-beat sound to mimic the old power unit. Surprisingly it's not a gimmick but a pretty effective way of enhancing the car's otherwise subdued engine note. Ford is known for value for money products and, just like before, this Focus ST offers a wealth of kit for its sensible price tag. In the high-spec ST-3 grade, there's plenty of leather trim plus a pair of suitably sporty front seats and a powerful audio unit. Proof that Ford's Focus ST is a good car comes in the form of more power from an approved upgrade option. Not every car is happy dealing with more power and torque through the front wheels, but in testament to the ST's underlying talents the extra shove is welcome and easy to exploit. That it doesn't cost a fortune is another plus point. 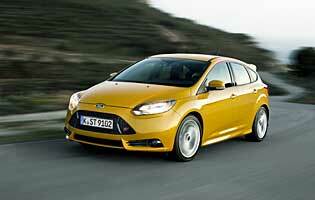 Be under no illusion that the Focus ST will be a frugal and inexpensive car to run. While Ford has made considerable progress with smaller engine cars, the ST can be a thirsty beast if driven enthusiastically. In fact, it's not all that economical around town so you're buying this car with your heart not your head. However, it is an improvement on the old model, s you should see a reasonable reduction in tax through a lower CO2 rating. Insurance won't be a steal for any hot hatch but you can expect a modest drop over the old car due to improvements made to repair and spare part costs. For a family car it's surprising how modest the cabin oddment storage provision is. There is space for your belongings, just that Ford could have been a little more generous when designing the door pockets and centre console. Thankfully the car's ample boot makes amends, although the modest lip could hamper the loading of large or heavy items. Folding the rear seats is an easy task and liberates even more space. 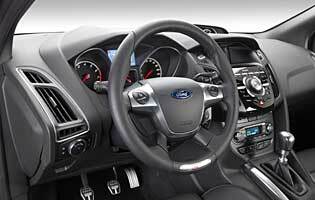 As befits a performance Ford, along with the stylish main instruments, there are more dials on top of the dashboard displaying turbo boost, oil pressure and oil temperature. They're small and positioned away from where they need to be to be useful while driving, but they're still welcome. The ancillary controls are laid out in predictable fashion and the stalks feel chunky and robust. The one incongruous element is the centre console screen, which is styled quite differently to the rest of the car's instruments. Below it are numerous small buttons that could be more intuitive at first glance. With its firmer than standard car suspension, the ST delivers a good blend of ride comfort and minimal roll when pressing on. The grippy sports front seats hold you in all the right places, and when you don't feel like Stirling Moss the Focus will amble along without making a racket. The Focus is among the most secure of the current crop of modern cars, with security experts Thatcham awarding high marks for both resisting theft from and theft of the car. It also performs well in the overall insurance rankings. An advanced alarm and immobiliser combination is standard, while given the ST's appeal you might want o invest in a GPS tracker for added peace of mind. As you'd expect, stability control and ABS are standard along with a generous tally of airbags, while a host of intelligent systems like lane departure warning, auto brake and lane keeping assist are optional and elevate the Focus to a position closer to that of modern executive car's than you might first appreciate. With its added injection of power and torque, the Mountune-badged Focus ST certainly feels livelier than the regular ST. Aurally there's little between them but on the road the Mountune car's extra pace is evident not only in a straight line but also in the way you can power out of corners. Naturally you need to be more responsible as the extra power pushes the car closer to its - and your - limits. Wheelspin in the wet is easily achievable and there's a need to be more precise with your inputs on twisty roads. Thankfully it remains a docile car for the urban commute. Clearly identifying a need for an affordable, rounded hot hatch, Ford has tailored its Focus ST towards keen drivers with families or other responsibilities. As such there's no three-door hatch option, but there is an impressively versatile estate version that's also eligible for Mountune surgery. While a regular Focus might be a good choice for the novice driver, an ST - Mountune or not - is probably not an ideal mode of transport for all the obvious reasons: performance, running costs, insurance. Ford's reputation in the hot hatch market is a good one, although the company has taken the occasional sabbatical as it chose to focus attention on its volume selling cars. The original Focus ST generated a considerable amount of goodwill among buyers, and this second-gen version appears to continue this trend. 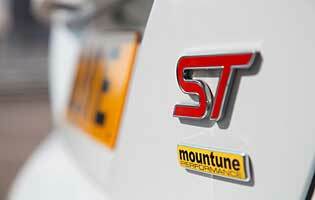 Less well known is Mountune, although having become Ford's go-to official tuner its profile can only increase. With the Focus now five-door only, accessibility is therefore very good. The doors are long enough to allow easy access but short enough to make getting out of the car in typical bay spaces simple enough. Access to the boot is good although the car's tailgate is on the heavy side, plus the load lip may restrict ease of access to heavy loads. This is area where even the standard car has received criticism, as some of the stereo operation buttons are quite small, with notable space in between them. It can be difficult to put your finger on the right one without taking your eyes off the road for a second or two, and it may take a little longer to become fluent with than some other systems. That aside, the unit's performance is impressive and does much to add to the car's premium feel. For such a potent car, Ford gives you the choice of bright and subdued exterior colours. Obviously the former help telegraph the car's intentions loud and clear, and do much to enhance its visual appeal. The interior trim is also very attractive. The shiny black plastic centre console cover will divide opinion, though, as it doesn't gel that successfully with the rest of the cabin. Disappointingly, there's very little view at either of the rear corners, so drivers need to rely on the wing mirrors as well. As such, reversing safely is a slower process than would be ideal. The variable-assistance power steering works well and rear parking sensors are a welcome inclusion. Petrol engine options – 1.0-litre (99bhp, 123bhp); 1.6-litre (84bhp, 104bhp, 123bhp); 1.6-litre turbo (148bhp, 179bhp); 2.0-litre turbo (247bhp). Diesel engine options – 1.6-litre (94bhp, 113bhp); 2.0-litre (138bhp, 161bhp). Transmission options: five and six-speed manual gearbox depending on model, plus automatic gearbox (1.6-litre 123bhp petrol and 2.0-litre diesels only). Trim levels: Studio, Edge, Zetec, Zetec S, Titanium, Titanium X, ST.